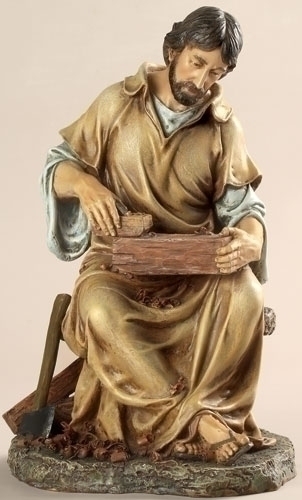 This 10.25-inch The Carpenter Figure is part of our Joseph Studio-Renaissance collection. 1 x 3/4-inch Sterling Silver St. Rachel Medal. 1/2 x 1/4-inch Gold-Filled (14K) Blessed Trinity Medal. This 14K gold-filled medal offers the luster and beauty of solid 14 Karat Gold at a much lower price. This Cross Pendant with Diamond measures 17.75 X 10 millimeters, approximately 3/4-inch by 3/8-inch. Made of 14K Yellow Gold, this piece features a weight of 0.57 grams. It comes ready for gift-giving in a complimentary jewelry box. Our 6 1/2" Multi Tincut Bracelet features our money-back guarantee. Our Sterling Silver Anthony 18" Chain & Box features our money-back guarantee. Our Sterling Silver Tutone Crucifix 16" Chain features our money-back guarantee. This Crucifix measures 5/8" in length. 1" Gold Over Sterling Silver Cross with 18" Chain. This 1" Gold Over Sterling Silver Cross with 18" Chain is made in the USA. Our Carded 14K Gold-Dipped Red Cross Ring Size 6.0 from Symbols of Faith comes in a deluxe gift box. Our 14K Gold 1/4 CTW Diamond Cross Pendant features our 60-day money back guarantee and free Shipping Insurance, as does our entire line of religious jewelry. Part of our Religious Pendants line, this Cross Pendant features a weight of 1 DWT, which is the equivalent of 1.56 grams. Made in IN. Comes in a high-quality, attractive jewelry box. This 10.25" The Carpenter Figure has passed our quality control assessment and meets our strict criteria to be a Catholic Shop product. Buy with confidence.